Steph Geremia, traditional flautist and singer, is highly regarded as among the top musicians of her generation. Known for her vibrant style and versatile musicianship, Steph has been highly influenced by the great North Connaught style of flute playing. As a regular member of the Alan Kelly Gang, she has performed and toured extensively around the globe and worked with many critically acclaimed artists including the Grammy award winning Chieftains, Eddi Reader, Sea Road Sessions, Kris Drever, Johnny ‘Ringo’ McDonagh and many more. 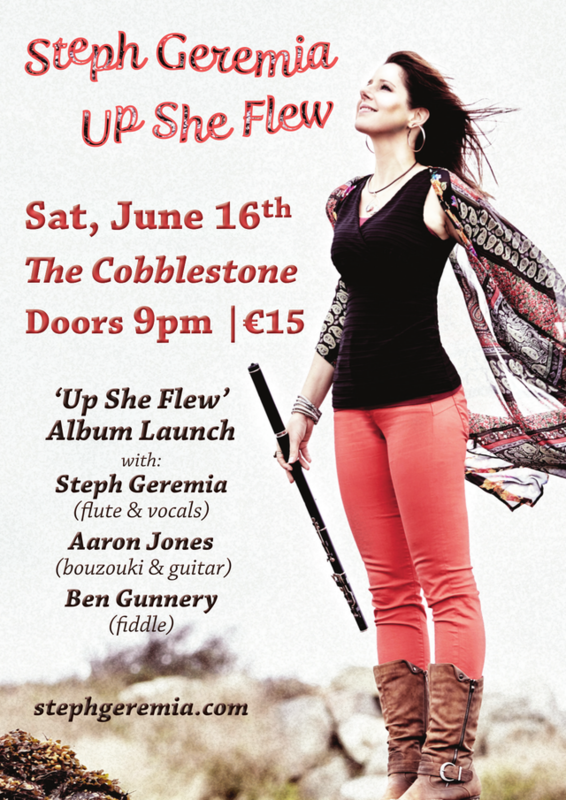 After nearly a decade since the release of her debut solo album, which was described by Irish Music Magazine as “an unexpected treasure” and deemed her as “one of the most promising young flute players around”, this June 2018 will see the release of Steph’s highly anticipated second solo album, Up She Flew. Steph will be joined by her band including Scottish powerhouse, Aaron Jones (Old Blind Dogs) on bouzouki/guitar/vocals and Dublin born / London native, fiddle maestro, Ben Gunnery (Riverdance / Barrage). With a firm mixture of traditional and contemporary arrangements and production, the album features music from Sligo, Leitrim and North Connaught. Steph is joined by a star studded gang: Aaron Jones (bouzouki & guitar), Seamie O’Dowd (guitar), Jim Murray (guitar), Alan Kelly (piano accordion), Donal O’Connor (keyboard), Ben Gunnery (fiddle), Jim Higgins (percussion), Martin Brunsden (double bass) and Michael Rooney (harp). Produced by Donal O’Connor & Steph Geremia.